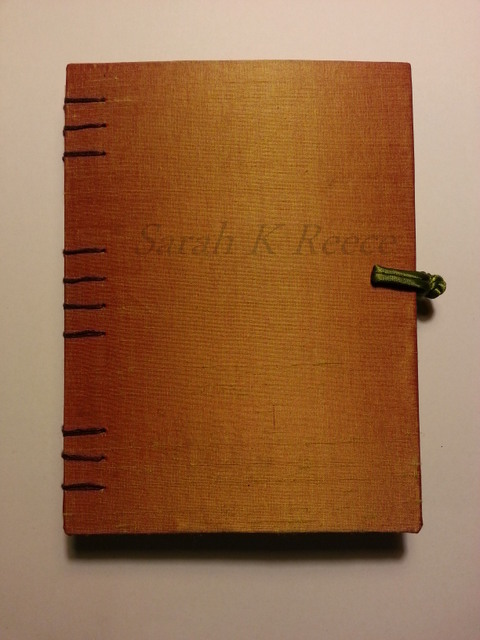 I have completed the Artbook I created after my miscarriage earlier this year. Inviting you to send in things to be cremated with Tamlorn was a deeply moving experience for me. Afterwards, it felt to me like the most natural, connected, public artwork imaginable, for such a private and taboo experience. I wanted to capture some of the sense of ritual and connection for others to use as inspiration in mourning their own losses. I’ve been distressed to be part of support groups and hear how isolated and hurting so many people are. The peach silk cover, chosen because of the peach tree we planted to remember Tam by. To the left are some of the names of other unborn children people sent to me. On the right, three seed pearls have been sewn to the watercolour vial to represent the glass vial of tears we sent with the box to the crematorium. 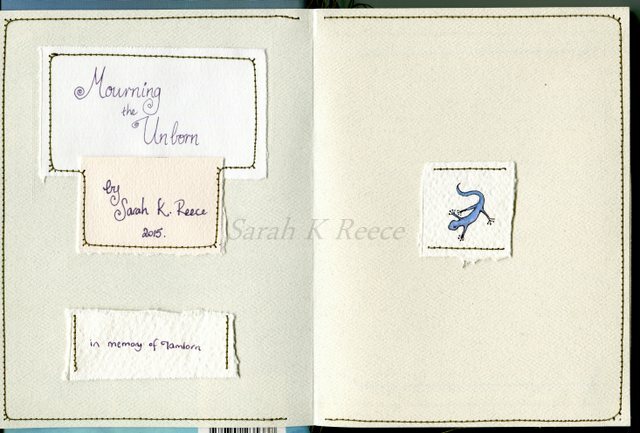 On the right, a silk ribbon embroidered rose has been stitched into the book. Now that we are trying to conceive again, the time feels right to share it. I am currently talking with local services about an exhibition of this book and my other art about pregnancy and grief to raise awareness and help start conversations. I am also reaching out to other communities such as those affected by partner violence to create exhibitions that speak to their experiences also. My next big task is to reproduce it in a colour photo book edition so that I can share it with you. Update April 2016: I have now completed this project! View my beautiful photobook of this artbook in my Etsy store.